HURRAY! It's the first day of Autumn! I LOVE this season as it marks the beginning of one of the most fun times of the year. Pumpkins, the smell of cooking spices, candles, turning the fire on, baking pies (something I am looking forward to!!) and - of course! - pulling out the fall related books! I pulled our fall books on the shelf a few days ago and it's so fun revisiting some of our favorite titles. That said, I really only have a handful of good ones for fall! (Shocking perhaps? I know.) I'm definitely looking for suggestions to add some good stories to our collection - specifically relating to pumpkin patches. Got anything for me? 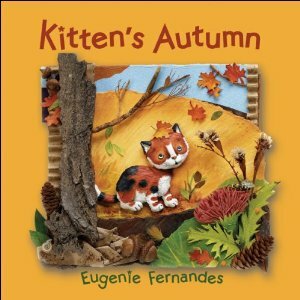 One title we added to our collection this year, courtesy of Kids Can Press, is Kitten's Autumn . Both boys like this book and I confess I do as well. The story itself is very simplistic and is told in rhyme, through the eyes of a little kitten. Each page spread shows a different fall scene, with different animals collecting food for the winter months or just wandering around. What makes this book so incredible in my mind is the way that the illustrator (and author) of the book, Eugenie Fernandes, presents her scenes. Her illustrations are actually, what she calls, made up of a multimedia collage. (This would explain why I found it hard to tell at times if I was looking at a scene made out of clay or paper or a painting.) It's a mixed bag which is intriguing to the eye. Her scenes look three-dimensional and we love looking at the whole page spread before turning the page to move on with the story. It's just so very unique. Apparently Fernandes's father, Creig Flessel was one of the original comic book illustrators back in the 1930's and 40's. He positioned her art desk right next to his and so she grew up exploring her creative gifts. She also married an illustrator so one can only imagine what the creative genius that might be possessed by their two children! To learn a little bit more about her, you can visit this particular author/illustrator page. We love this book and I'm excited to know that Kids Can Press also released a Kitten's Spring book earlier this year. We'll have to check that one out when that season rolls back around. But spring can wait, as far as I'm concerned! I want to revel in the fall months a bit and soak up THIS season. So what about you? Do you have any particular ways you are planning to enjoy the fall? I'm currently delighted to be near the end of "morning" sickness with the onset of the season. I'm so looking forward to enjoying food again. This is kind of a nasty season to have to miss out on all the goodies so-- bring on the food, the stable system and the pumpkin patches! I'm so ready! that book looks so sweet! we did a Ff is for Fall alphabet craft today! I don't remember that we did anything special in the fall -- just enjoyed the colors. I love the season too. Our most noteworthy fall project is making massive amounts of applesauce and apple crisp... and enjoying the beautiful color and coolness outside. I was just thinking yesterday that I'm loving the crisp days of fall! Sun shining, but not too hot and just gorgeous! We will celebrate Autumn by apple picking on Columbus Day. The orchard we go to has hayrides on that day if you bring a canned good. They also have a pumpkin patch. So much fun!! !